There is nothing I love more than Brussels sprouts. They have such a delicious flavor and are packed with big-time healthy nutrients. The thing I love the most is that they are cheap and can be made in just about no time. I think the key to learning to love Brussels sprouts is to not overcook them. If you overcook them, they get mushy and smell like cabbage. That, my friends, is not good eats. I like to think of this cheesy bacon version of Brussels sprouts as the perfect “learn to love this green vegetable” recipe. Who doesn’t love lots of cheese and bacon? It’s time to start loving your vegetables. 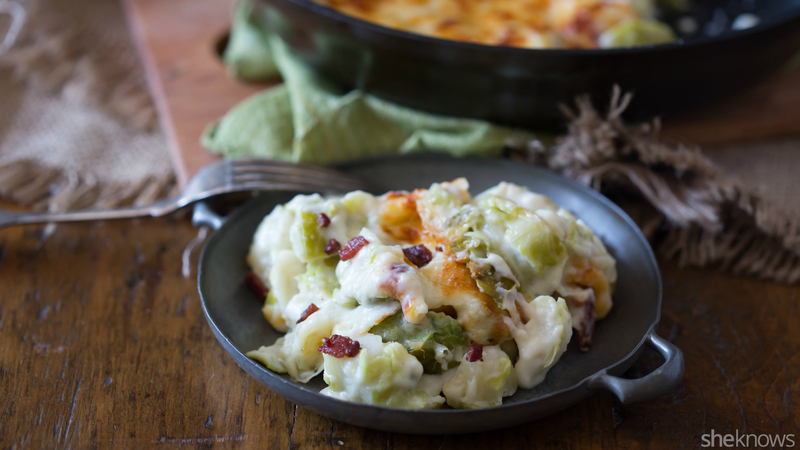 This gratin is stuffed with sharp cheese, Brussels sprouts and crunchy bacon. What’s not to love? When boiling, add in the Brussels sprouts, and cook for 4 minutes. They should be bright green in color. Remove from the heat, and drain in the sink. Immediately run cold water over the blanched Brussels sprouts to cool them down. Let strain while you prepare the remainder of the dish. To a 12-inch, oven-safe skillet set over medium heat, add the bacon, and cook until crisped. Remove the cooked bacon from the pan, and set it aside, leaving the bacon grease in the pan. Add in the onion, and sauté until golden brown. If there is not enough grease in the pan, you can drizzle in a few teaspoons of olive oil to help sauté the onions. Once the onions are done cooking, sprinkle on the flour, and stir to coat. Slowly pour in the milk while stirring at the same time. Once all the milk has been added, stir until the mixture starts to bubble slightly and thicken. Once it gets thick enough to coat the back of a spoon, stir in the garlic powder and 1/2 cup of cheese. Stir until smooth, and turn off the heat. Stir in the bacon and Brussels sprouts, and make sure the mixture evenly coats them. Season with kosher salt and pepper, if needed. 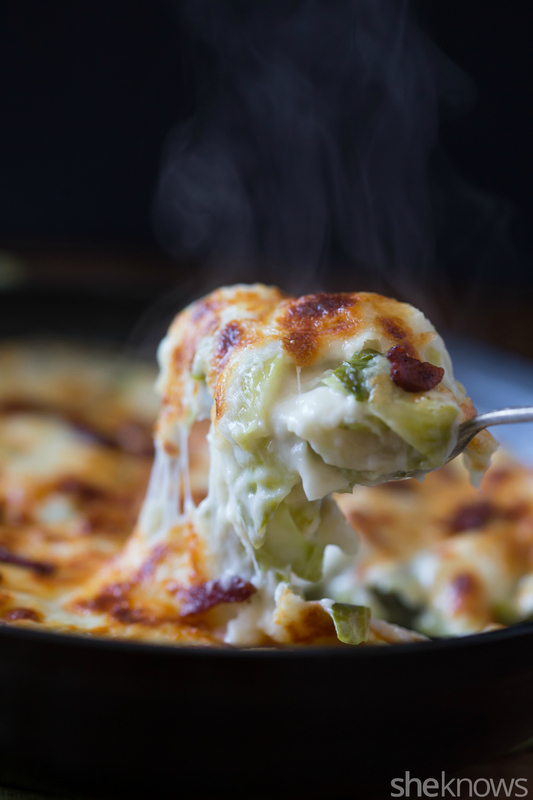 Smooth the top, sprinkle with the remaining cheese, and place the pan in the oven for about 20 minutes, until the gratin bubbles and is browned on the top.